Due to unexpected weather the team was forced to abandon their summit attempt. High winds blew in the night before their planned summit attempt and didn't subside until 3 that morning. Rather than risking a descent in the dark, the team retreated back to ABC to await a better weather window later in the week. Ben phoned in from ABC to let us know that the remaining members of the team still in need of the summit are taking a few days off for some well deserved r&r before heading higher. Their plan is to start heading back up the hill on the 11th, then hopefully to the summit on the 14th. Be on the lookout for audio dispatches from the higher camps including one from the summit! 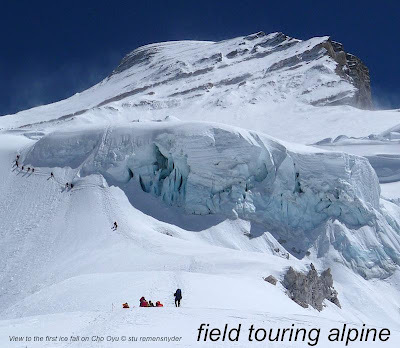 FTA Cho Oyu Expedition 2011 - Summits!!! Ben has called in to let us know that Siddhi and Sophie has made a great effort to reach the summit of Cho Oyu in just over 22 days from Kathmandu! They had planned only to do a carry to C3 but instead felt strong, saw a good weather window and had some other teams to help push the route through. They topped out at 1:45pm Kathmandu time on the 5th and had great weather. They are making their way to ABC where they will be greeted with Lhasa Beer and a summit cake by Ratna! Ben and Keith are feeling strong themselves after a good night at C2 and they will make a bid in the next weather window which looks to be around the 9th or 10th. They still have nearly two weeks left before they need to leave ABC so they do have plenty of time for good window. Enjoy listening in to Ben's hoarse voice as he shares the news! We have a few spaces still for this summer's Broad Peak and K2 trip and are gearing up for Spantik in August and Satopanth and Cho Oyu for September. In October and November we have the Khumbu Three Peaks and Passes, Everest, BC treks, Island Peak climbs and Ama Dablam. see our website for the latest dates and prices!